WE invite YOU to join us in the very important mission of FHNB through purchasing an annual membership. The mission and top priority of FHNB, Inc. is to reach as many of the nation’s 56 million persons with disabilities as possible. We are determined to provide fishing and other related opportunities to them that might not otherwise be available. 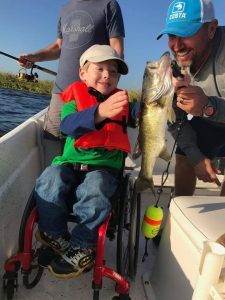 FHNB’s mission is focused on the inclusion of people of all abilities when it comes to experiencing the great outdoors through the wonderful world of adaptive angling. We, at FHNB, hold ourselves accountable to ensure you that we are reaching individuals with disabilities who have never experienced the joy of catching fish, the smell of fresh lake air, or tasted his or her catch for the very first time. FHNB strives to be the best adaptive angling non-profit volunteer organization geared towards all persons with disabilities, regardless of age, race, or gender. Our goal is to keep operational costs down, leaving funds for the true mission of opening up angling opportunities for everyone. We offer persons with disabilities a chance to live a dream, gain independence, boost morale, meet new friends, and create memories that no one can ever take away. Our membership dues help raise the needed funds to expand and open up the world of fishing to disabled individuals where no other programs exist. Please join the Fishing Has No Boundaries ®, Inc. National Organization. There is no greater gift than enriching the lives of others. Your support will help us continue to do just that.